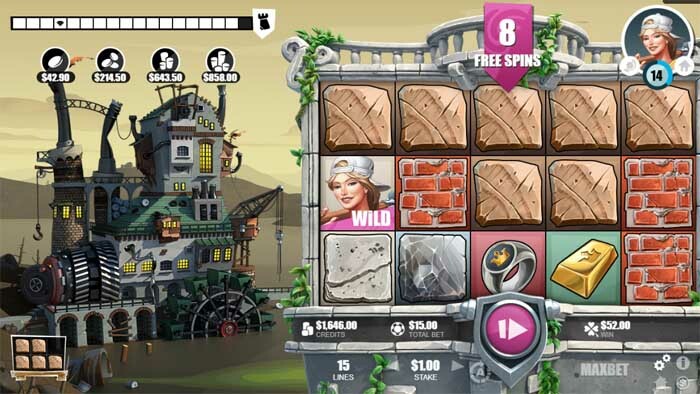 Have you ever thought of combining an online slot game with a strategy game? Those two don’t quite fit together, do they? 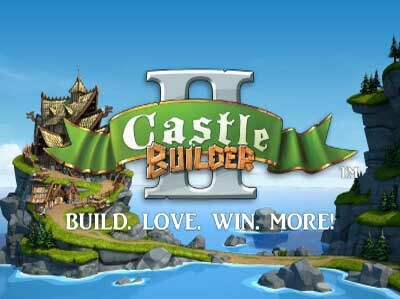 Well, it turns out software developer Rabcat thinks otherwise, which you can witness in this release – Castle Builder 2! As soon as the game loads and even throughout the first several steps before you actually reach gameplay, you might even find yourself wondering whether this really is a slot game. 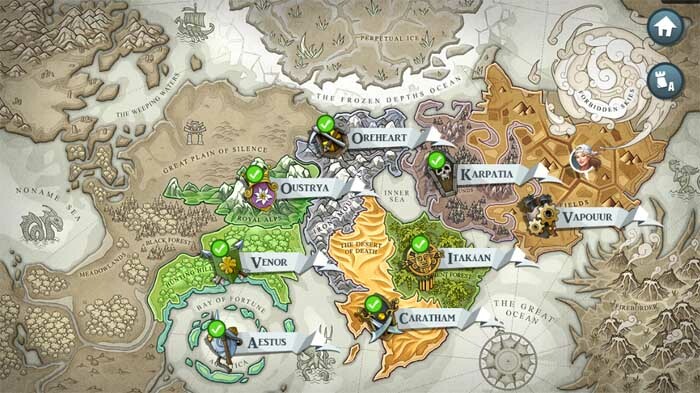 At first you get to choose a character, after which you need to select your section on the map. And only then do you actually get to see the reels. The graphics here are truly next level. The backdrop shows us a series of hills with your small plot of land that you need to build and develop. And the reels are set on a castle wall. The symbols here are especially interesting, though. You don’t have the regular lower value playing cards of their suits, as is usually the case. Instead the lower value symbols here are four different building materials: wood, bricks, granite and iron ore. These are essential for the building process moving forward. What’s more, they also differ in rarity and value, but more on that later. Following them, there’s a ring with a crown on it, a gold ingot and a treasure chest. Last but not least is the highest paying crown symbol, offering payouts of up to 50 times your stake. As for the layout in Castle Builder 2, at least here things are a little more conventional, featuring 5 reels and 3 rows. There are 15 paylines in total and you can’t adjust the number of lines you play per spin. This means that you bet as little as only 15p per spin. And the maximum amount you will be able to wager on these reels is £30 per single spin. The RTP here is set between 95.50% and 97.75%, depending on how far you have progressed in the game. The old man with the glasses in this online slot game is the Wild symbol. Just like any of the other symbols, it can appear on any of the reels, in any position. Furthermore, it will also substitute for any of the other symbols here to help create winning combos. As a matter of fact, when forming a winning sequence of five Wild symbols, you can expect prizes as high as from the crown symbol. Now, we pointed out earlier that you will be needing to collect building materials, in order to progress throughout the game. You collect them by spinning the reels and landing winning combos with the respective material. These will then go into a pallet to form a building block. The more building blocks you create, the more the meter at the top of the screen will fill up, bringing you closer to completing your building. Now, once you complete a castle, there will be a wedding for the princess and you will need to choose a suitor on her behalf. The more castles you have by this time, the more options there will be to choose from. The suitor you select will award you a certain cash prize. Note also that this slot game also has a regular freespins feature that you can take advantage of. In order to do that, you will be looking to land at least 3 Scatter symbols in any position during the same spin. 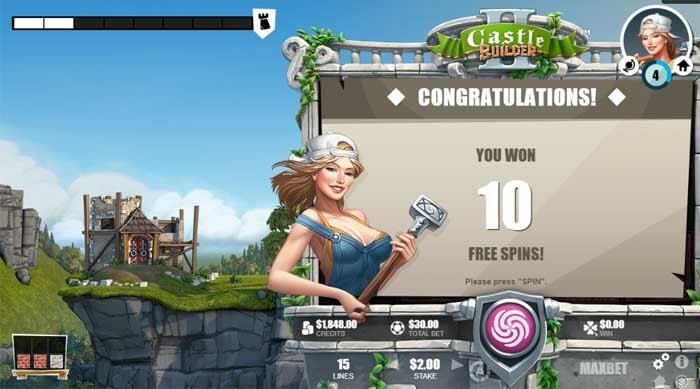 Depending on the exact number of Scatters you landed, you can count on receiving 10, 15 or 20 freespins. This will also allow you to potentially accumulate more building materials. After you have completed a castle, the royal wedding feature will begin. Here you can choose a suitor to marry the princess, where each suitor has a different payout value. 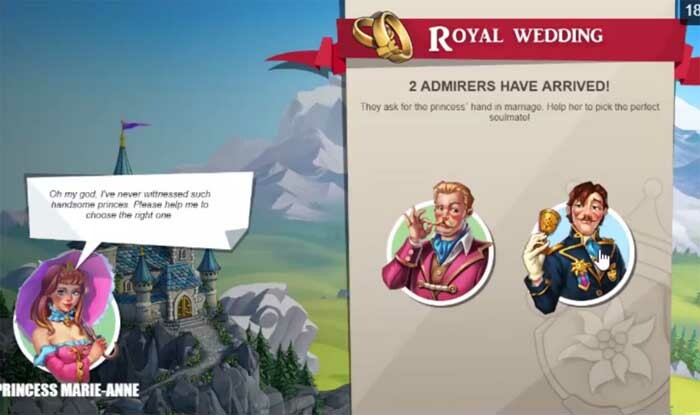 Later on in the game, the castles will get harder to build, but the amount of suitors for the princess will increase, as well as the payouts they offer. Another level in this slot game that you should also keep in mind is the Cup Challenge. You begin with the Bronze Cup and can slowly make your way to Silver, Gold and Platinum. To complete the Bronze Cup Challenge you will need to land 6 building materials in a pallet, for which you will receive a prize. Fulfilling the subsequent challenges will obviously require you to gather more building materials, which will also be harder. But the rewards for that will also be more substantial. Note also that after you have completed the first challenge, you will have the freedom to build whatever type of castle you want. 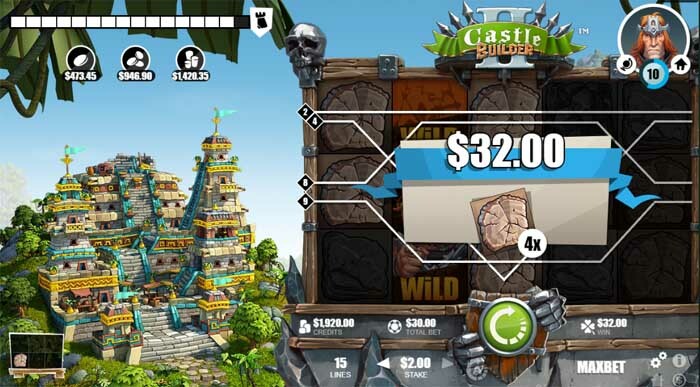 Castle Builder 2 is quite the game and certainly not something you will often come across. It’s complex and layered with several things to keep in mind at once. But at the same time it’s also wildly interactive and keeps you engaged all throughout gameplay. Furthermore, the rewards here can truly be massive. And as the structure of this game may take a little getting used to, you might want to keep things very low key in the beginning. But overall, it’s a super slot game with great visuals and a really well-thought through setup.